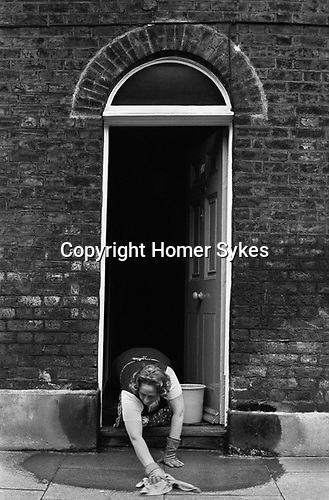 A house proud resident washes her front door step and pavement, creating a separation from the everyday grime and the virtuous cleanliness of the inside. Roupell Street was first developed by John Roupell in the 1820’s. Artisans and skilled workers originally occupied this Georgian terrace of nineteenth century cottages in the heart of Southwark. It was one of several streets developed by the Roupell family who had made their money from lead smelting and scrap metal. The properties in their Lambeth Estate passed into private ownership in 1976.